The Simpsons has been dropped from morning TV in Venezuela after being deemed unsuitable for children - and has been replaced by Baywatch. The popular US cartoon about the yellow dysfunctional family was branded "inappropriate" and pulled by the country's television authorities. Caracas TV station Televen has started showing episodes of the beachside show in the same mid-morning slot. It became famous for its bikini-clad stars, including Pamela Anderson. It said that some unspecified complaints had been received from viewers. 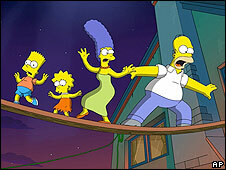 Televen's manager may decide to show The Simpsons, which has been dubbed into Spanish, at another time of day. The station is showing episodes of Baywatch Hawaii, a later incarnation of the lifeguard rescue show which started in 1989. The serial, about a group of beach lifeguards, gained notoriety for its attractive male and female cast members coupled with glamorous locations and slow-motion running sequences. Venezuelan TV is known for filling its schedules with re-runs of old US series and Latin American soap operas. But it also includes a talk show hosted by the country's president, Hugo Chavez. In an episode of the weekly programme last year, the Venezuelan leader gave a speech which reportedly lasted eight hours. An abridged version of the show has been broadcast every day since February 2007. Is The Simpsons still subversive?